Virtual reconstruction of northernmost section of pre-Incan temple in Bolivia. Here’s why a general education may equip the workforce of the future better than job-specific training: you never know what skills will be needed. 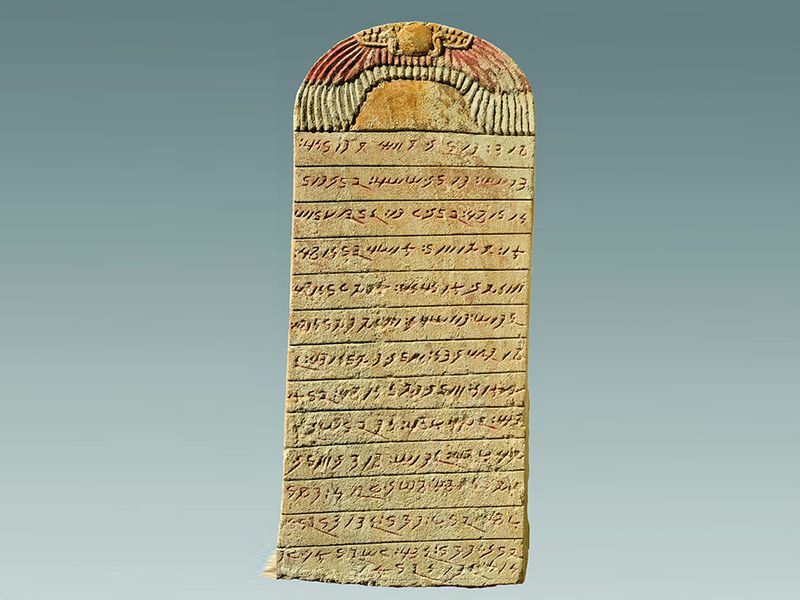 In this example, a new breed of adaptable archaeologist is expanding the use of 3-D technology to reimagine lost worlds. George Dvorsky writes at Gizmodo, “The 1,500-year-old Pumapunku temple in western Bolivia is considered a crowning achievement of Andean architecture, yet no one knows what the original structure actually looked like. Until now. “Using historical data, 3D-printed pieces, and architectural software, archaeologist Alexei Vranich from UC Berkeley has created a virtual reconstruction of Pumapunku — an ancient Tiwanaku temple now in ruins. Archaeologists have studied the site for over 150 years, but it wasn’t immediately obvious how all the broken and scattered pieces belonged together. The surprisingly simple approach devised by Vranich is finally providing a glimpse into the structure’s original appearance. Excitingly, the same method could be used to virtually reconstruct similar ruins. The details of this achievement were published [last December] in Heritage Science. “To overcome these difficulties and limitations, Vranich and his colleagues integrated historical archaeological data with modern computer software and 3D-printer technology to reconstruct the ancient temple, and by doing so, devised an entirely new approach to reconstructing and visualizing ancient ruins that would otherwise be impossible to build. “The team created miniature 3D-printed models, at 4 percent actual size, of the temple’s 140 known pieces, which were based on measurements compiled by archaeologists over the past 150 years and Vranich’s own on-site observations of the ruins. … The researchers could have performed this work exclusively in the virtual realm, but they had better luck with tangible, physical pieces they could freely move around. “Satisfied with their Lego-like configurations, the researchers keyed their creations into an architectural modeling program, culminating in a single hypothetical model of the temple complex. This wasn’t terribly difficult, as the construction methods used by the Tiwanaku people, and how they formed their incredibly geometric stones, are well documented, explained Vranich. But the exercise yielded some new findings. These large stones come from the foundation of an early 17th century garrison house near Durham, New Hampshire’s Great Bay. Sea-level rise is adding urgency to archaeological digs. I’m losing count of the ways that melting glaciers and global warming are beginning to affect our lives. This story comes from New Hampshire, which some readers may be surprised to learn has a border on the ocean. As glaciers melt and waters rise, parts of that border are washing out to sea. 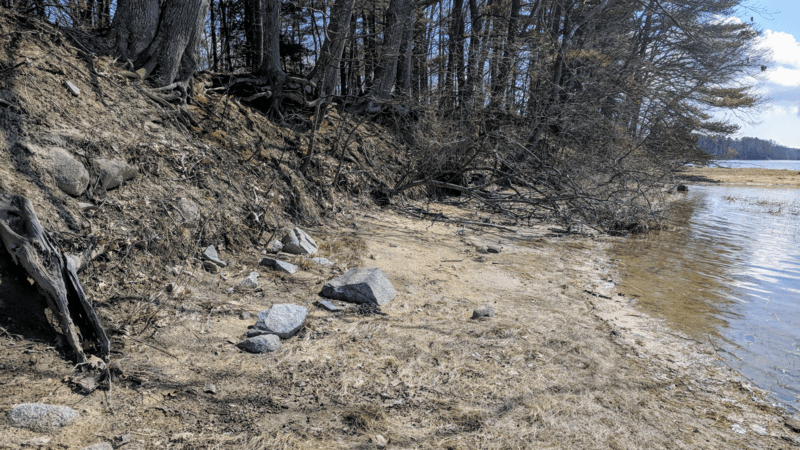 New Hampshire Public Radio’s Jason Moon “joined a [University of New Hampshire] researcher for a hike to see a centuries-old archaeological site that is literally washing away. “UNH anthropological archaeologist Meghan Howey has a map. It was made in 1635 and it shows the location of garrison houses that once stood near Great Bay in what is now Durham. Garrison houses, in case you’re wondering, were a sort of fortified log cabin built by early colonial settlers in New England. “Howey and a team of volunteers discovered the location of one of the garrison houses on that map – the remains of a structure where some of the earliest Europeans to ever be in this region lived, worked, and died. “But that exciting discovery came with some sobering news. “We reach the end of the forest, where a steep bank drops to a narrow strip of sandy beach. Howey points to the ground beneath our feet. “I realize that she’s not showing me what’s here, so much as what’s gone. Most of the land where the garrison house once stood has been eaten away by the rising tidal water of the bay. “Just one corner of the garrison house’s foundation remains on solid ground. A few feet away, Howey points out a couple of bricks submerged in the shallow salty water. She says the bricks were likely part of the garrison house’s chimney and could date back to the 1600s. They are what remains of an archaeological site that’s largely been lost. “In a new report, she combined sea-level rise projections from climate scientists with the location of historic sites on the Seacoast. She found that as many as 1 in 7 of the region’s known historic sites are at risk. “In many cases, saving historic sites like this from climate change just isn’t feasible. So the best Howey can do is to document what’s here before it’s gone — an archaeological race against time. The newly discovered “commander’s house” was found while digging Rome’s Metro C subway line. It dates back to the 2nd century. Nowadays, archaeologists get involved at construction sites early, especially if there’s a suspicion of buried culture deep down. It must be frustrating for builders to delay a project when something of historical significance is unearthed, but I like to think that some builders (or perhaps some low-level workers) find it exciting to be part of history. I like to imagine that once in a while an inspired worker goes back to school and becomes an archaeologist. In Rome, a subway project first revealed unexpected treasure in 2016. Elena Goukassian has a report at Hyperallergic. 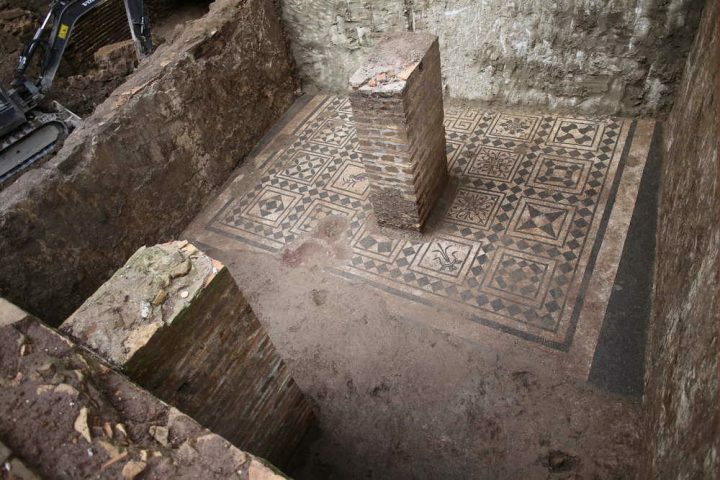 “In the summer of 2016, while digging the new Metro C subway line in Rome, workers came across a rare archeological find, a 2nd-century CE Roman barracks. [More recently] archeologists uncovered the remains of a ‘commander’s house’ (domus) connected to the barracks, ‘the first discovery of its kind in the Italian capital,’ according to the Agenzia Nazionale Stampa Associata (ANSA). Great pictures at Hyperallergic, here. 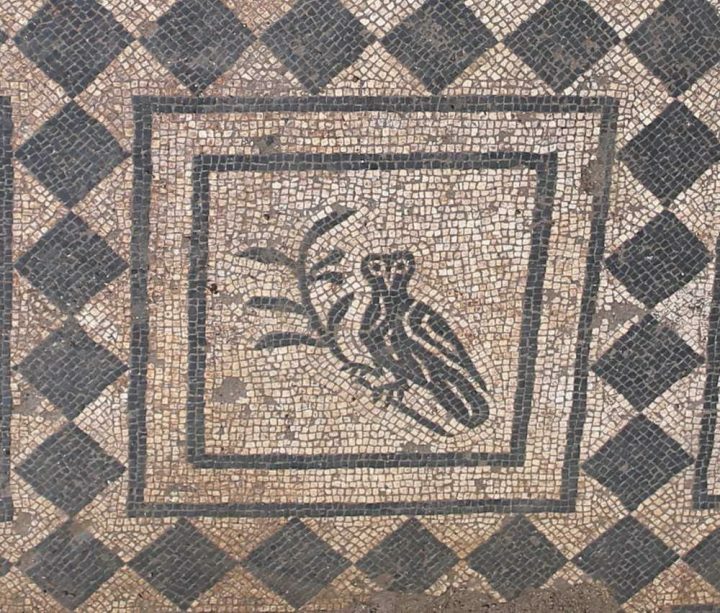 Who wouldn’t love the mosaic owl discovered under a subway line in Italy?